For me and I’m sure for many others a balcony is a place to hang up our washing and store everything we don’t need at the moment – from prams to bicycles and tools. Actually, that balcony space can be used for a lot more than just an extra storage area. A balcony lets you connect to outdoors even if you are living in a big city and are surrounded by steel and cement every day. So, take a good look at your terrace and create a little oasis – your favorite place, where you can relax and wind down after a hard day. 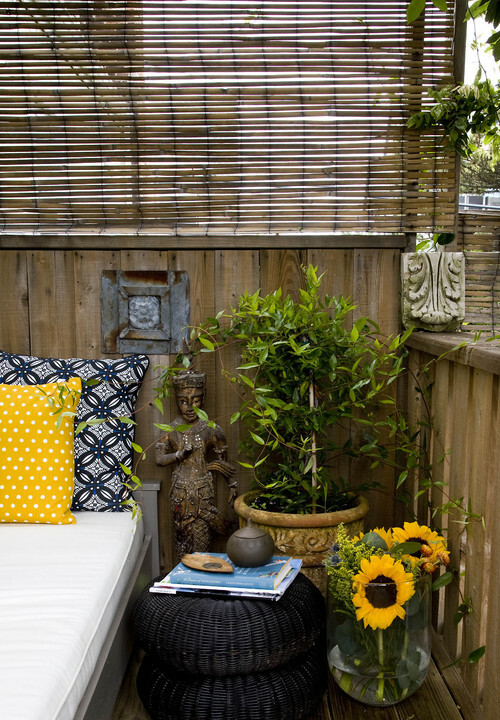 Here are our 4 tips for creating a cozy balcony! Plants make a huge difference on your balcony. They give you a sensation of being in nature even if you are actually surrounded by hundreds of city buildings. There are different ways how to use plants in your tiny balcony. You can try to create a miniature balcony garden with herbs, some tomatoes, and strawberries, or just use flowers to make the space more colorful and happy. Using plants as a decorative element also helps to provide privacy and add shade where needed. When you are choosing the plants for your balcony also think on flower pots and planters. There are tons of options to choose from. Decorate your window sills with colorful pots or if you are interested in a modern and sleek look, check out fiberglass and stainless steel flower boxes. Nothing creates a cozy atmosphere better than some well-chosen lighting. You can get creative and search some DIY projects for romantic mason jar lanterns and outdoor chandeliers or have fun with some fairy lights. Fairy lights give your balcony a magical feel without blowing a budget. You can also decorate your terrace with small Chinese lanterns or metal lanterns with candles. If you are planning to spend some relaxing time on your balcony, be sure to add some kind of seating option. Chairs, benches, egg swings and bean bags make a great place to curl up, enjoy a cup of tea and take some time off of your hectic schedule. Are you on a budget? Consider creating a bench from plastic storage containers, plywood or sturdy crates. Garage sales and thrift shops may have some hidden treasures too! If you don’t have enough space for a chair, use a comfy rug or cushions to create a cozy area for reading and relaxing. Another great idea is to add a hammock to your balcony. Can you imagine taking a nap in a breezy hammock, star gazing or just dreaming of a beach vacation? To make your balcony, a really cozy place use accessories! Accessories are a really important part of your cozy balcony design and they help you to complete the look you were going for. Colorful rugs, pillows, and cushions not only make your balcony a comfortable but also create an inviting and warm ambiance. Flowy curtains give your balcony a Mediterranean feel and at the same time, they help to keep your privacy. Also, climbing plants and flowers keep you from prying eyes and give your balcony a secret garden atmosphere. Do you have a balcony? What do you use it for?